Why do I feel like a prisoner to my emotions? Why do I feel like a blur going through life? I feel unworthy to hold the positions in life that I have. Not knowing how to get back to where I was. Everything in life is possible with him by my side. No matter what the situation in life. I can’t get to the light…can’t get to the top of the mountain. Falling farther each day…feel like Satan’s getting a grip on me and I can’t get away. Fill my mind and body with your Holy Spirit and send these feelings of hopeless and failure away from me! Break me yet again and continue to mold into what you need me to be. Let me rest in you…pray with you, fill my mind with your word, worship youBring me back to your feet Lord…back to where I know I need to be. I thought I would let everyone know that I'll be signing off my blog for a few weeks...God has revealed to me that I need to take time to be with him and my family...that I need to place all things to the side for the time being! I will be back in a little bit...I pray God will continue to bless you all richly and be an encouragement and strength to you each and everyday...we'll talk to you soon! Thank You Mom...I Love You! I was one of four people to talk, about encouragement and how I had been encouraged, at our church's Mothers and Others Tea in May. I've been thinking about my mom a lot the last little while and thought I would blog my "talk". She's my example of perservance and strength, unconditional love, given me a positive example of marriage and reminds me to always live each moment of life to the fullest and with a smile on my face and in my heart! She's been on my heart a lot this week...through my mom's fight with kidney disease, I have see the truest form of true love and living out of your marriage vows through my parents. My dad is by my mom's side always...never complaining, always informed and concerned for her well-being...truly selfless love...for better or worse, in sickness and health. They have shown me that marriage and life isn't just about the good times...that there are ups and downs...but usually those times are the ones which strengthen our faith and strengthen us as a person...I love my parents so much and that's where this post comes from! When I looked back at the past year, I realized how difficult a year it has been. This year for me was one full of uncertainty and stress, sadness and grief and the true realization of how sick my mom truly is! The other realization was the avenues of encouragement, which were with our family during this last year. My husband and best friend and my family are a constant source of encouragement. My small group, church family and friends are also a constant source of encouragement. During the good times this year, people have been there to encourage me with notes, telephone calls, hugs or handshakes during greeting times on Sundays and many other ways. During the harder times, people have encouraged me by offering to help me during weeks which were overwhelming or uncertain, through prayer for my family, especially my mom or simply by letting me know if I needed to talk, that I had a lot people I could call. These may seem like very simplistic things, but I wanted you to remember that encouragement doesn’t have to be a big deal—it can simply be a phone call, e-mail, stopping to chat a couple of minutes or just dropping a note to someone to let them know you are thinking of them. What seems not so important to us could really be an encouragement or turning point of someone’s day! Many times God talks through the smaller things in life and he isn’t selective about who he chooses, so we need to remember that he might choose to use you or I in a big way, through something we think might be small or insignificant. I think someone who does bring me a lot of encouragement in my life is my mom. She has always told me that I can do anything I put my mind to. As I began motherhood, my mom was always there if I needed help, but she has allowed me the blessing of learning and growing from my mistakes. She is always just a phone call away and even if she can’t be right there, because of distance, she always encourages me with laughter and humour, stories of when I was a child or just offering me loving concern. My mom has strength of steel and a positive outlook, which helps her through all circumstances. My mom’s strength and perseverance, as she battled and beat cancer, and now as she battles kidney disease, are a constant encouragement to me. She has taught me how to live my life fully, no matter what roadblocks may come along the way. Even though she has discouraging days, uncertainty with her treatment, fatigue or a multitude of other things, she always manages to keep a positive attitude, sees the humorous side of things and is thankful for the fact she’s living a good life, filled with a multitude of blessings and love. She has taught me to always be there for those around you and that even on your worst days, by helping to brighten someone else’s day through laughter or a kind gesture, you will not only be an encouragement to them, but also will allow yourself to be uplifted and see the blessings you have been granted. 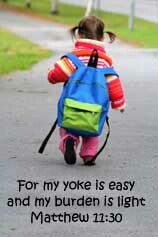 I’m thankful for the fact the Lord uses people sometimes in the smallest of ways, to be an encouragement in our lives. I’m blessed with an amazing family, church family and friends, who support and encourage me everyday, and I just wanted to say, “Thank You!” for your constant encouragement and love! These are two of my favorite worship songs...I was singing one this morning and thought I would post it and while doing so, stumbled across the words for the other. I love to store music in my memory bank...it seems that during my darkest or trying of times, some of the most beautiful worship songs come into my mind and allow me to escape...to meet with Christ and focus completely on him. What a wonderful avenue of opportunity you have given me...I'm blessed daily by worship music and the fact I'm able to come into your presence with it! Beautiful, oh, yes, You are. Wonderful, oh, yes You are. Yes, You are, Yes, You are. I was reading this morning through one of my many notebooks...I have a lot of them! I always have a notebook or journal available for writing my thoughts, poems, songs, etc. When I go to a retreat, I always have a notebook to write down the speakers thoughts and promptings. This notebook had notes from a Ladies retreat I attended a couple of years ago and I thought I would share some of the speaker's thoughts. Cleaning Out Our Prayer Closet, What Should We Throw Away? We need a special prayer closet to be able to retreat to! We need to begin our prayer lives with sitting and realizing how much God loves us! Then our response is to worship him with prayer. Ordinary people bringing ordinary concerns to a loving Father. God give me strength for this day...if we prayed this as a breath prayer, simple but strong and meaningful! You get a word or phrase from a scripture being read and then talk with God about what it means for you. I'm going to end with a quote from Mother Theresa..."God is the friend of silence." Lift my hands to you. Sing a song of praise to you. My Savior, my Prince of Peace. I will surrender all to you my Lord. And praise you in Holy surrender. I long to be in your presence. Let me walk with you forever. I surrender all to you my Lord. All to you my Lord. So often filled with uncertainty. Not always knowing how to deal with what’s coming next. To mold and shape my children’s lives! How do I possibly know what to do? How do I show them all the things I want to? To raise them to be the remarkable people I want them to be! I lay them lovingly and caringly at your feet. Teach me to be patient and to lay my worries and fears at your feet always. Help me not to get down as a result of my frustrations and the bad days. The gift of motherhood and the precious gift you gave me--my children! I wrote this for my kids on a very trying day a couple of years ago...I love being their mother more than I can express...some days in parenting are definitely harder than others! There are days when you look in the mirror and think God why do you think I'm the right one...those days when the person looking back from the mirror isn't always the best of examples. I'm praying this year for more and more patience...hoping I'll be the best example to my kids I can when it comes to their spiritual walk, having patience, sweating the small stuff and doing what's right in the eyes of God! Then there are those days when you get a comment like, "Mommy, your the bestest in the whole wide world!" and the daily I love you's, hugs, kisses and budding senses of humors...that confirms my thoughts that they are true God-given blessings...our lives would definitely have a void without them there. I am truly blessed in this lifetime, no matter what the situation or season of life...thanking God for that! A daily devotional and prayer time with God...I've struggled to obtain a concreted one in the first 13 years of my walk. I don't really know why...I know when I first became a Christian, I started out reading right from the beginning...our pastor talked about this in church a few weeks ago and I had to laugh because he was so dead on the mark...about how you get through the first couple of books and then you hit Leviticus and Numbers and you get really bogged down...that was a real understatement for how I felt in those books for the first time! No one told me where to start...when I was first married, it was a struggle, as I was so sick (pregnancy induced) that first year and then was sleep-deprived for the next few after that, while growing our family! So what have I done to change this? I came to the realization that I needed to fill my life with his word if I expected to grow closer to Him! In the last few years, I have started bringing my Bible in the van...when my kids were in public school, I got a lot of Bible reading done while waiting for them after school. I read a lot when we are travelling on the highway...when my hubby's driving of course! In the the last few years though, I've longed for that stronger relationship with Him...I've tried a few different reading programs and am currently in one which allows me to read from 7 different parts of the Bible in a year...my goal is to have it completed in a year....the last couple of years, I've almost made it...this year I plan on being successful! My prayer life just kind of grew as I grew in him...that's the part which has always kind of been there. My problem is that I don't always speak my prayers...somedays I journal them...I have a few prayer journals...one for a praying mom, one which is a devotional and a prayer journal and then a plain journal that I write freely in. This may seem silly, but I have a prayer box...I read it somewhere, that to allow you to carve the time, this allows some starting points throughout your day. I have topics in there, such as my current church (vision, etc. ), the pastoral staff, the families of the church, the ministries of the church, the board, my province, country and the government, my family (both saved and unsaved), my friends (both saved and unsaved), my kids and their future, my husband in many aspects and myself in many aspects. Do I always use this as my prayer avenue? No, I have most of my times where I'm in a quiet place talking with him about what's on my heart and what he prompts, but it does allow an opportunity on those hairy days to pick a few cards and pray for the contents, plus then just talking time with God. I've learned a lot in the last 7 months about learning to discern God's voice, through all the static and interference you often hear. I listened to a lot of Casting Crowns music on my travels this summer...I travelled between two cities for a little over a month, as we waited for our house to sell and I wrapped things up at my job with our former church. Some of their songs spoke to me heavily...I'm going to quote part of one and also one of the scriptures they gave with the song...it has really helped me in knowing that some of the decisions made in the past months have been the correct ones...I'm so amazingly at peace right now, which is definitely the amazing part of surrendering all aspects of life to him! Time and time again, "Boy'll, you'll never win!" To keep me from becoming conceited because of these surpassingly great revelations, there was given to me a thorn in my flesh, a messenger of Satan, to torment me. Three times I pleaded with the Lord to take it away from me. But he said to me, "My grace is sufficient for you, for my power is made perfect in weakness." Therefore I will boast all the more gladly about my weaknesses, so that Christ's power may rest on me. That is why, for Christ's sake, I delight in weaknesses, in insults, in hardships, in persecutions, in difficulties. For when I am weak, then I am strong. I've had an interesting year in terms of health...we won't go there today! Since our move, I've battled with some really bad recurring headaches...had went a little over a month without one and then they started up again at New Year's. I've also battled stiffness in my fingers, arms, legs and neck since the end of November. I just figured it was a mixture of everyday living, stress and me getting older, so I kind of just went along in life. My hubby got me to go to the doctor last week, as I've never been one to have a lot of headaches...we had a friend earlier this fall who started having really bad headaches and it ended up being an aneurysm...he beat the odds and survived it, but it has changed our thinking in how we look at a lot things. So my doctor told me I have a virus...I didn't really think a virus could survive that long in your body, but apparently it can. I couldn't get my medication though, as with the move, we didn't receive our health care stickers...apparently I could have got it and submitted stuff, but I was stubborn and waited for the sticker to come in the mail. So I have this anti-inflammatory to take...it makes the pain go away extremely fast! The downside, as with a lot of medications for me...the side effects...I get them...so I guess I'll suffer through them and hope that in two weeks, the pain will stay away. I guess today is a venting post...it's funny how people say that I'm not telling the whole truth because I don't always say how I'm feeling healthwise. It's not that I choose to "lie", but that I've learned to tell people what they want to hear. I've learned to realize when someone is truly asking how you're feeling and when someone is just asking because it's the right thing to ask. I've had my share of health battles this year...I've seen more of a doctor's office than I really cared to and more than I had in a long time...I don't like to be sick, don't like the looks you get when you say you're sick yet again and just figure it's best to say things are going as good as can be expected. If that's lying, then I guess I'm guilty...sorry, but until you've seen the eye rolling looks over you being continually sick, then you probably won't understand the logic behind it! I'm going to end with quotes today...I like to have calendars with quotes and scriptures around, so I can draw from God's words, but also gain insight from others as well! "Each one of us is God's special work of art. Through us, He teaches and inspires, delights and encourages, informs and uplifts all those who view our lives." "The Lord your God...will take great delight in you, he will quiet you with his love, he will rejoice over you with singing." "Be content with who you are, and don't put on airs. God's strong hand is on you; he'll promote you at the right time. Live carefree before God; he is most careful with you." It's hard to believe that 13 years ago today I made the decision to accept Jesus Christ as my personal Lord and Savior! Time has flown by so fast! I was in my Grade 12 year at school and it was a couple months before my birthday...I like to tell people that it was my early birthday and graduation present to myself. It was kind of funny how things happened! I grew up Presbyterian and was taught about God, prayed, learned to have great faith in God in all circumstances, learned that as a follower of Christ, the greatest thing you can do is to serve him in all aspects of your life, including the church...I attribute my parent's teaching to why I have learned to have such faith in God, no matter what circumstances arise. They gave me an awesome spiritual foundation and I love them so much for that! My parents were heavily involved in our church...my dad was the head of the board and often took the services when our minister was away...I often attribute that to the fact of why I always have an inkly to start taking classes to get a pastoral degree (more realistic will be to take a two year program in Reglious Studies), as I would sit with him at the kitchen table as he prepared his sermons. I usually ended up leading our youth services on those Sundays when we took the service and helped introduce my little Presbyterian church and our youth choir to Petra and Michael W. Smith. I was also known as the kid who refused to be confirmed into the church 3 times...let me tell you, that doesn't go over well when your dad is involved in the church the way mine was! The first two times were because I didn't feel ready, because of my age and then because of where I was in life. The last time, as everyone said, she'd become "born-again"...I knew I was leaving home for college and would be attending a different church, so I did not feel a need to go through the motions of tradition. It's really interesting how things play out sometimes...I went through a really hard stage of rebellion in my teens...I really dragged my parents through the wringer! They were amazing parents...parented me the best they could...our story is living proof that your child may stray from the path, but if you stick by them no matter what, they very well might find their way back. Through everything they told me that they loved me and would always love me, no matter what played out in my life! I was a honor roll and music student (loved choir and concert & jazz band), taking advanced classes and hanging out with one of the worst crowds in the school. Somehow I managed to get myself into a really abusive relationship, began smoking (only at school and friend's houses), had thoughts of suicide cross my mind on more than one occasion, attempted to run away from home twice and had one of the worst attitudes you could have...I look back and don't even recognize that girl, can't explain why I made the choices I did, but truly believe that it happen for a reason! I have a huge heart and understanding nature for teen runaways, for girls and women who are, or have been, in abusive relationships, for those kids who come from a good home, but end up looking like they've thrown it all away and no one understands why or how they could do that (I totally understand why and how they could do that!) and for all those people who have a past, but end up laying it all down at Christ's feet, and no matter how hard it is, they eventually realize that he accepts you no matter where you've been or what you've done! My youth pastor led the devotion which stirred my heart and brought me to the realization that I needed to asked forgiveness and accept Christ personally! He introduced me to the world of worship singing, youth leading and children's ministries, the world of church office administration, became one of my many examples of how to balance a spouse, family and church ministry properly and...he's the pastor who married us! He told me this very important statement shortly after I had committed my life to Christ...I was struggling to truly accept God's grace...these words impacted me and stay with me always...he told me that you can choose to be a victim to your past, or you can choose to find a positive aspect out of your past! For me, that meant not being ashamed of the road I'd went down, counseling girls from abusive relationships as a young youth leader, to always have an understanding heart towards people and to never judge anyone's choices in life! A year and a half before I made my commitment to Christ, everything fell to pieces. As I was picking the pieces of my life up and starting over, I remember praying to God and telling him I was sorry that I'd hurt him and my family. I asked him to help me turn my life around...I told him that if he would reveal a different road for me to take, I would do a 360, turn, take that road and never look back! I truly believe that on January 15, 1993, he revealed that road to me and I took it, followed and am continuing to follow it and will NEVER look back! I used to speak evil things against Jesus. I tried to hurt his followers. I really pushed them around. But God showed me mercy anyway. I did those things without knowing any better. I wasn't a believer. Our Lord poured out more and more of his grace on me. Along with it came faith and love from Christ Jesus. Here is a saying that you can trust. It should be accepted completely. Christ Jesus came into the world to save sinners. And I am the worst sinner of all. But for that very reason, God showed me mercy. And I am the worst of sinners. He showed me mercy so that Christ Jesus could show that he is very patient. I was an example for those who would come to believe in him. Then they would receive eternal life. With the most amazing gift. My soul mate forever and always. The ability to reach me when no one else can. You are always true and an open book. Your love for your family fills my heart with overflowing joy. So honored to be the one God chose for you! I can only hope and pray for an eternity for our love to grow to its deepest levels. So I pray I will cherish ever moment with you as if it were our last! Three posts in three days...that won't always happen! Why this post? I'm feeling extremely fortunate to have my man by my side...he was handpicked by God for me and I love him more everyday! The words in my title were probably the most traditional things about our wedding...my parents had this end their ceremony and I stood my ground for it to end mine as well. The one thing which blew people away, was the fact that before my sweetie would propose to me, he drove to my parents house and asked their permission to marry me. That was considered extremely "old-fashioned" in our time, but man did it make me feel special and extremely loved and cared for! It showed who he truly was to my parents...he sent them a letter afterwards, thanking them for allowing him to marry me...I've never seen that letter, but I know it concreted in my parents minds how strong his love and devotion truly was for me! When we got married, the norm was to purchase invitations, etc. We got someone to take pictures of us and our rings, got them put on CD and made our own invitations...before digital cameras. Made our own wedding programs, my mom and grandma insisted on making our cake...the bakery decorated that. I altered and wore my mom's dress, but made my own headpiece...my sweetie and my sister came with me to make sure the alterations were all good...man, did we hear about that one, seeing me in my dress and all...oh no, what will we do! There were 6 weddings that day, so we had our pictures taken before the ceremony...heard about that as well! We didn't use the traditional wedding music...I walked down the aisle to "Jesus in Your Eyes" by Julie and Buddy Miller (an amazing song from an amazing singer), our wedding party came into "Jesu, Joy" by Bach (my favorite composer...I'm a romantic at heart), so when we left the church, we found "Jesu, Joy" played by the Bowker Brothers (two amazing Christian pianists), left in a 60's convertible with a hooga horn and stopped at 7-11 for Big Gulps on the way back to the hotel for a quick rest in between things! (Boy, did the 7-11 staff have deer-in-the-headlight looks when our whole wedding party walked in...dressed in our wedding attire of course!). That was the other thing...we only had two people stand up for us and then had a ring bearer and flower girl...we didn't want a big performance, we just wanted to start our life together...never have wanted a ton of attention! Driving home with the wedding gifts and some of my "old" furniture for the new house...the mirror for the dresser, which we thought was tied down good, somehow broke loose, flew through the air like a huge frisbee over one car and landed on the highway in front of my sister and our best man's car...went to see what was left and found nothing but a lot of little toothpicks! Some of our superstitious relatives flipped about the bad luck we would receive...we're not superstitious, so we've just used it as a joke factor throughout the years...it's tended to lighten the mood during some of those bumpy roads! "A recent article in The Times newspaper reports that, increasingly, modern brides are exchanging traditional "till death do us part" vows in favour of more realistic alternatives. Recognizing that a lifelong marriage to one person is becoming more and more uncommon, young couples are using phrases like, "I promise to be loyal as long as love lasts," or "until our time together is over," to encapsulate their commitment - such as it is. This is not a fringe movement, either. One wedding planner claims she can't remember the last time a couple promised to stay together until death separates them. As Sharon Naylor, author of Your Special Wedding Vows , explains, "(Couples today) understand that you do not make a promise you cannot keep." A 1998 Statistics Canada study found that a majority of Canadians would not remain married if they were unhappy. A full 60% of Canadians believe that divorce is the best solution for couples who can't work out their marriage problems. (1) In fact, only one third of Canadian women say they would stay married if they weren't happy." You know...I was a young bride, in my very early twenties...but I knew what I was doing and was ready to take the "plunge" forever, regardless of what played out, as I knew my sweetie was handpicked by God for me and that with him in control of it, we'd be great together no matter what! After we said our vows, we then pledged our faith to each other...I'm so glad we said it the way we did. Three-quarters of our wedding attenders didn't know Christ, so I guess you could say that we wanted our wedding to be a "subliminal" message to people...people let us know right from the day and even months after, that our wedding caused them to think, was different than most they attended (in a good way). We were glad for that...it was a celebration of our start together and we wanted everyone to know we were together FOREVER...what an AMAZING ride it's been! 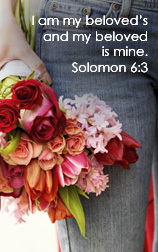 "I take you to be my wedded wife/husband, to live together according to the pattern of God's Holy Word. I will love and cherish you, honor and sustain you, in sickness and in health. I pledge myself to be true and loyal to you until the coming of our Lord Jesus Christ, or until God separates us by death." Mr. Cinder...I'm yours forever and always and I wouldn't have it any other way! Allow your beauty to shine through me everyday. For the amazing love you show me each day. Teach me to lean on you and trust in you. Allow me to be in complete and total surrender to you. 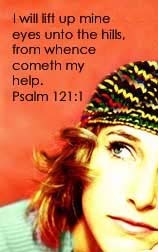 Help me to come to you for guidance and love. Gently mold my spirit to where you want it. Humble my heart before you. Give me a gentle spirit and a loving heart always. Lead me down the path you have chosen for me. That your light will guide my way, no matter where you take me. Let your love and Holy Spirit consume my whole being. I pray your will for my life will be the roadmap I use each and everyday! Mold me into the person you want me to be. "The Lord your God is one; so love the Lord God will all your passion and prayer and intelligence and energy." Sometimes the biggest challenge in my Christian walk is to totally surrender everything...even when I do, I always seem to end up taking something and putting it back on my plate...I don't really know why I do it. I've had the great pleasure of being able to go to prayer every Wednesday...no matter what frame of mind I go in, I always walk away being blessed by God and my friends who enter that room each week. Last night a friend prayed that we would focus ourselves on God this year, not on people, places, situations, etc. I took that line home with me...thought through it as I shopped for our never-ending grocery list (the staples which we inhale on a weekly basis...my husband and I joke about the fact we need a cow and a flour mill to keep up!) It mulled through my self-concious last night as I slept and was still with me this morning. As a result of our move, I seemed to focus myself anywhere but with God...I stayed rooted on the people and place I left, on the fear of starting over and having to meet new people, get involved in new and sometimes different ministries, having to find new friends, mentors and accountability people...at times I made sure I was as far away from God as I could possibly be. Last night I thought about it...that's not who I am, who I've ever attempted to be...I think I thought I would lose all my friendships if I didn't "stay in the past", but I honestly don't know what I thought. We moved to an amazing church...it fits us in ways we've been looking for a long time...it's bigger than our old one and coming in I assumed they wouldn't have places for us to fit in...I love to serve God alongside others through ministry and there was an intense fear of not being needed to do that...an intense fear of failure or not measuring up...but there have been places, some familiar ministries and some new undertakings...no imaginary success bars which have to be obtained, continual praise for anything you're able to offer to God and an intense welcome into the circle to serve Christ together. I determined last night that my goal for this year is to fix my eyes completely on God. I want to live like Mark 12:30...I want to love him with everything I have to give, with every aspect of my life...when I'm closest to him is when I have my greatest inspirations, love of life, peace and "god" ventures. I no longer want to be prisoner to my saddness and depression about my move, but instead want to be built up and encouraged by the new friends he's given me, the new opportunities and ways of life he's brought me and the clearer feeling of his presence each day. I need to quit focusing my energy on the past, people and places and start focusing it on him...we have a picture, actually a hard-mounted poster, about riding tandem on a bike with Jesus and at the end it talks about giving total control to God and letting him have the handlebars. Total surrender...as scary as it seems sometimes for me, that's what I'm going to do this year, because I know I'm at my best in life when I'm able to totally surrender him all aspects of my life...what an adventure we'll have during 2006--I can't wait! It's funny how society seems to have boxes which everyone fits into, and if you don't fit into those particular boxes, you're considered to be out of the norm! Along with those boxes come certain expectations and rules expected of the people in those boxes. I've never tended to "fit" into my expected box...I don't believe in people having a certain box...I like to live outside the box when I can. As I've said before, being a follower of Christ, wife and a mother are three of my greatest blessings, but a lot of times, society's view of being a wife and a mother seem to overshadow the important fact of me being a follower of Christ. I got married in my early 20's and we began our family pretty soon afterwards. So I guess you could say I'm a young mom of three...some would say I just don't want to grow up and be completely in my roles, but that's definitely not the case! I don't think I do my husband or my kids any justice by giving up every part of myself...the things which make me who I am...my hobbies, passions for life and ministry, my dreams and aspirations for life, etc. Last year for my birthday, my husband bought me a guitar...I've wanted one for a while, but never looked at them, because I always make sure my family's need are taken care of before my own...that's what you do when you're a wife and a mom! I grew up playing piano and trumpet...being in band allowed me the chance to experiment with my friend's instruments, so I've tried everything over the sun...my sister played the french horn, so we traded and taught each other to play...I began singing on a worship team as a teen and sometimes played drums in the band. I love to write poetry and sometimes take that a step further and attempt to write songs...if I'm in a real adventurous mood, I'll write music for them as well. So, I've always wanted to learn another instrument and both my husband and I thought a guitar would be a good thing, as I could have it with me when writing music for my songs...it's a little more portable than the piano! The reactions I got about my birthday gift were funny...why on earth would I ask for a guitar? I apparently should have asked for something a little more practical, less frivolous and more in line with what a person in my roles of life should ask for! I guess you could say that I don't like to conform to society's boxes...I like to say that I enjoy living outside the boxes of life! Earlier this fall, I was struggling with a real battle...God was prompting me to go outside my box, but I'd kind of backed down and began to live in my expected box...so I kept telling God there was no way I could say yes to what he was asking...my excuses were that I was a wife, a mom (a new homeschooling mom at that) and that made me a wrong candidate for what he wanted. Then one of my pastors...our church is blessed with three truly gifted and God-led pastors...preached on Rahab and the faith of a prostitute. His sermon spoke mountains to me about the fact that God doesn't conform to boxes...a paraphrase of one of his quotes said, "God laughs at us when we think that we know everything and have everyone in boxes...he can come and take the boxes away!" That got me thinking and then he quoted, "Unexpected blessings through unexpected breaks are how God makes jokes!" That sermon increased God's prompting...he was prompting me to go missional, to go abroad to the mission field on a short-term basis. After a lot of prayer and contemplation, I finally said if you want me to go, I will. So now my husband and I are crossing those bridges of figuring out how to make this happen...we'll be going together when it happens, which is really outside of the box, but very exciting! My family sees me for who I truly am...I'm their wife and mom...and I do those jobs the way my family needs them done. I just add a little spice to them, by being a woman who strives to carve out time with God and also a bit of time for me, tries to examplify to my kids the importance of serving God and those around you (in my mind, this is the most important thing my kids can learn from my husband and I...and take into their lives), who blogs on the sidelines, loves music, writing and drawing and so much more...who might live outside of society's box, but will always be there for them no matter what and at a moment's notice. I'm going to end with one of the scripture passages which was quoted in that fall sermon...it made me think about the fact I sometimes use society's boxes as an excuse not to serve God the way he wants, and that's not a good practice for me to get into! Thanks again to Bible gateway...they save me a bit of typing! Brothers, think of what you were when you were called. Not many of you were wise by human standards; not many were influential; not many were of noble birth. But God chose the foolish things of the world to shame the wise; God chose the weak things of the world to shame the strong. He chose the lowly things of this world and the despised things—and the things that are not—to nullify the things that are, so that no one may boast before him. I've never really liked making New Year's resolutions...everyone makes them with such good intentions...but how many people actually keep them? As the New Year begins, I've made some life decisions, but wouldn't consider them to be "resolutions". I'm a wife and a mother...take these roles very seriously, as they are two of the greatest blessings I've received...my greatest one being my salvation and walk with Christ! Sometimes, though, I tend to worry about everyone else and making sure they're taken care of and doing well...not saying that's a bad thing! But I don't always take enough time to examine my spirituality, health, etc. and my life decision this year is to make more time for me and God...to grow my spiritual health and to make sure I'm rested and healthy, because the truth is that I'm no good to my husband or kids if I'm sick, spiritually unhealthy or suffering from burn-out. We made a huge step of faith this year...a year ago, my husband and I discussed the fact we would eventually need to examine his job situation. It was in a sector of the work force which was unpredictable...he'd been through lay-offs once, there was a chance of that happening again and always the uncertainity about whether or not you would be hired back. His job was heading a direction he didn't want to be going and so he began thinking about looking for work. At that time, I began reading and praying through "The Power of a Praying Wife" and prayed almost daily about his job and for him to have a job which he was happy and fulfilled at. This summer, he received a job offer and after a lot of prayer, we accepted it and had to relocate our family. That was hard...we had to follow God's lead, as he's never failed us and he's our foundation...he grounds us and glues our family together. But it meant leaving friends, ministries, a job which I loved doing...and to move and start from the ground up! There have been a lot of tears, sometimes anger and depression, a lot of sadness, but the gradual realization that God has reasons for us being where we are...just because we've moved, it doesn't mean we'll never be able to talk with or see our friends...and we will eventually make new connections (it may take some time) and life will continue on...no matter what, our family will be together, and always have each other, through all our faith journeys. We rang in the New Year with our friends who we said goodbye to earlier this fall. It was a lot of fun...our kids ran around with their friends and we played different varieties of board games and spent time visiting and laughing! Sunday we got to sit and listen to our friend preach his New Year's sermon...he talked about just like a winter blizzard makes the world look fresh and new, so does the Lord when we choose to be new in him. He talked about how God wants to renew and transform us, he's always working on us and changing us and he NEVER gives up on us...he continues to work on us! He said there was one statement he wanted people take with them, if nothing else..."No matter what your past may have been, your future is spotless!" The one thing I found fitting was the scripture our friend chose for yesterday...it was a scripture which was on my husband's anniversary card this year, only days after we knew we were moving...it was a scripture a lot of my friends gave me in goodbye cards and a scripture I now claim weekly, as I continue in the transition of my new life, in a new city. I'm going to end with it, as I think it's probably the greatest realization that I'm going to take into this year and hopefully it will be a comfort or grounding rod for someone else as well! Thanks to www.biblegateway.com ...they make it a lot easier to quote scripture when you can cut and paste it...makes for less typing errors! I hope everyone will have a very blessed 2006! This is GOD's Word on the subject: "As soon as Babylon's seventy years are up and not a day before, I'll show up and take care of you as I promised and bring you back home. I know what I'm doing. I have it all planned out--plans to take care of you, not abandon you, plans to give you the future you hope for. "When you call on me, when you come and pray to me, I'll listen. "When you come looking for me, you'll find me. "Yes, when you get serious about finding me and want it more than anything else, I'll make sure you won't be disappointed." GOD's Decree.